One of the biggest leaders who is always ahead in race of smartphones and gadgets and has been crowned of lord of gadgets around the globe, “Samsung Mobiles” has now officially announced two new elements in it’s premium range of Galaxy Smartphones known as, “Samsung Galaxy Mega 5.8 and Mega 6.3”. Strengthening their Android line up with, “Samsung Galaxy Mega 5.8 and Mega 6.3” and would be nice devices for those who wish to have huge screen display in their mobile phones. Now it is unsure how far this big screen fashion will go, we are already seeing line being blurred between smartphones and tablets. Rotating the view and throwing the spotlight towards specifications of device, the first line up in the series is Samsung Galaxy Mega 6.3 which the name suggest will sports 6.3 inches HD TFT Capacitive Touch Screen display with 720 x 1280 pixels resolutions. Such a huge screen size makes is hard to decide it as a phablet or a tablet. Dealing with it’s Platform dependency, this device will run on Android latest 4.2.2 Jelly Bean Operating System powered with a Exynos 5250 Cortex A-115 Dual-core processor clocked at 1.7 GHz, opening it’s graphics unit it support Mali-T604 GPU. Dual Core Processor coupled with Mali-T604 GPU to deliver exceptional gaming experience. 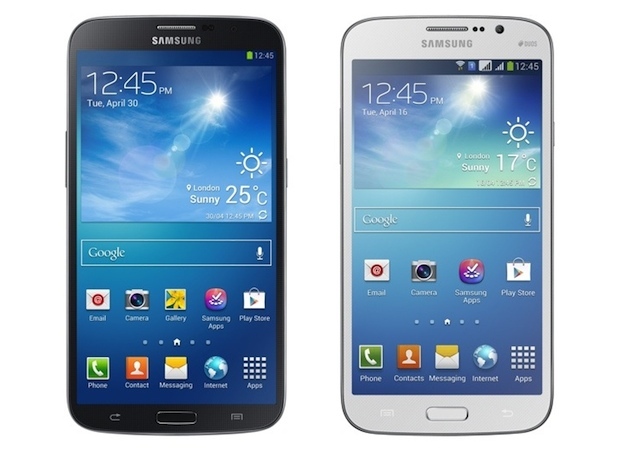 In terms of dimensions, Samsung Galaxy Mega 6.3 weighs nearly 199 gms and measures 67.6 x 88 x 8mm in overall dimensions. Briefing it’s Storage Specifications, it will support 1.5 GB of RAM with 8 GB of Internal memory which will be expandable up to 16 GB via microSD card slot. Enumerating it’s Image Optics, Samsung Galaxy Mega 6.3 is offered with a back camera rated at 8 MEGAPIXEL supported with LED flash technology and a secondary camera rated at 1.3 MEGAPIXEL for video calling. Some of the other features of camera include: Beauty Face, Best Photo, Best Face, Drama, Rich Tone (High Dynamic Range), Sound & Shot, Sports, , Continuous shot. Eying on to it’s Connectivity Specifications, Samsung Galaxy Mega 6.3 supports 3G, 2G, Wi-Fi a/b/g/n/ac, WiFi Direct, 4G BT 4.0(BLE), USB 2.0 H/S, GPS＋GLONASS, NFC, MHL and in area of sensors, it has a accelerometer, RGB light, Geomagnetic, Proximity, Gyroscope. To make the life going for this handset, it is equipped with 3,200 mAh of battery. However, there is no information disclosed regarding the pricing and availability for both these handsets. Speaking about the specifications of the second line up in the series is Samsung Galaxy Mega 5.8 which sports 5.8 inches of screen size with 960×540 pixels resolution which is slightly smaller display screen size as compare to the earlier one discussed above. Though all the specifications are same apart from the battery capacity, this device is equipped with 2600 mAh of battery against 3200 mAh battery of Mega 6.3.